I would love to win this book. I have one of Irina's other books and it's great. Thanks. Just tweeted about the book and giveaway. Thanks. Thanx for a chance to win this book. I admire her work & I'd like to add this book to my library. I tweeted about you book giveaway. Hope I win! 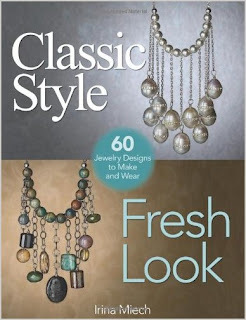 I would really like to obtain a copy of this book; I've been working with beads for a while now, but love to learn new techniques and get fresh insight from others-especially when it is about combining the modern with the "old" to get something new and yet familiar. I almost bought this book a month ago, but decided to wait. It would be awesomw if I won it! Thanks for the chance to win it! this looks like a really inspirational book. would love to win this book. thanks for putting up all these give-a-ways. Also shared on facebook. I would so love to win this book! I have been wanting this book for a while now, so how awesome would it be to get it for free! Pretty please count me in! I love the look of a classic style! This book looks like a real winner! Thank you for this giveaway offer and all the giveaway offers! This book giveaway looks divinely intriguing! I would love to add it to my collection. Lovely work! This looks like a wonderful book. Please count me in! I love to refresh vintage jewelry giving them an up-dated look. Thanks for this giveaway! I'd love to win. I'm very new to beading & I think this would help a lot! This looks like a great book. I'd love a chance to win it!